Geetha Ranmuthugala is an epidemiologist with a track record and interest in health services research, rural health, environmental epidemiology, and Aboriginal Health. 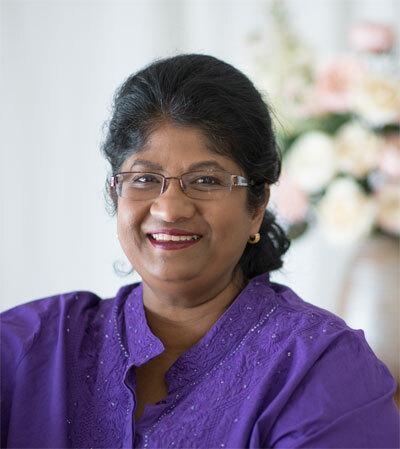 Having done her medical training in Papua New Guinea, Geetha practiced as a clinician in rural PNG, Sri Lanka and in Tasmania prior to training as an epidemiologist at the National Centre for Epidemiology and Population Health at the Australian National University. Geetha has a particular interest in research that will inform the delivery of safe and high quality care to rural Australians. Epidemiology, health service evaluation, research to inform health service redesign, environmental epidemiology. *NHMRC Mental Health Targeted Call for Research into Indigenous Youth Suicide Prevention, APP1076729. Indigenous Network Suicide Intervention Skills Training (INSIST): Can a community designed and delivered framework reduce suicide/self-harm in Indigenous youth? Role: CIF. $849,737 (2015- 2018). *NHMRC Project Grant: Evaluation of SCID-I in the diagnosis of mental disorders in Indigenous Australians. Role: CIF. $948,048 (2014- 2017). *ARC Linkage Project: $275,000 (2010 – 2012). Financing aged care in Australia: Mitigating fiscal gaps and maintaining intergenerational equity (LP100100810) Brown L, Harding A, Ranmuthugala G, Hancock R, and Anderson P. Administrating organisation: University of Canberra. *2007 (November): $69,511. Estimating the burden of disease associated with Respiratory Syncytial Virus in Australia. Abbott Australasia. A/Prof Laurie Brown and G Ranmuthugala. NATSEM. *2006 (November): $35,000. Early Career Researcher Strategic Grant awarded by the Monash University Faculty of Medicine, Nursing, and Health Sciences (ECD026). Effect of dementia training programs for general practitioners on the burden experienced by carers of dementia patients living in rural communities. Note: Grant not accepted due to moving organisations. *2005: $47,402. Australian Commonwealth Department of Health and Ageing. Feasibility study to identify aspects of rural placements that influence the likelihood of taking up rural practice. J Humphreys, G Solarsh, G Ranmuthugala et al. *2001 – 2002: $1,400,000. AusAID. Risks and Benefits of arsenic mitigation programs in Bangladesh. Smith, W, B, Caldwell, J, Caldwell, B, Douglas, R, Ng, J, Sim, M, Ranmuthugala, G, Milton, AH, Sinclair, M, Harris, A, Moore, A.
MBBS Honours (UQ), MBBS Integrated Learning Project (UNSW), PhD, MPhil. Partanen R, Ranmuthugala G, Kondalswamy-Chennakesavan, S, van Driel M. Is three a crowd? Impact of Medical Student Presence in the General Practice Consultation. Med Educ. 2016 Feb;50(2):225-35. Hawke KL, McGuire TM, Ranmuthugala G, van Driel ML. What do consumers want to know about antibiotics? Analysis of a medicines call centre database. Fam Pract. 2016 Feb;33(1):75-81. doi: 10.1093/fampra/cmv083. Epub 2015 Oct 26. Kondalsamy-Chennakesavan S, Eley D, Ranmuthugala G, Chater AB, Toombs M, Darshan D, Nicholson GC. New evidence on growing the rural medical workforce: Positive interaction between longer rural background and longer rural undergraduate training. MJA. 2015 Jan 19;202(1):41-5. Black EB, Ranmuthugala G, Kondalsamy-Chennakesavan S, Toombs MR, Nicholson GC, Kisely S. A systematic review: Identifying the prevalence rates of psychiatric disorder in Australia's Indigenous populations. Aust N Z J Psychiatry. 2015 May;49(5):412-429. Tang R, Ranmuthugala G, Cunningham F. Surgical Safety Checklists: A review. ANZ Journal of Surgery. 2014 Mar;84(3):148-54. Spangaro J, Zwi A, Adogu C, Ranmuthugala G, et al. What evidence exists for initiatives to reduce risk and incidence of sexual violence in armed conflict and other humanitarian crises? A systematic review. PLOS ONE . 2013 May 15;8(5):e62600. doi: 10.1371. Cunningham FC, Ranmuthugala G, Plumb J, et al. Networks in healthcare, their structures, characteristics and effectiveness. A systematic review. BMJ Quality and Safety 2012;21(3):239-49. Cunningham FC, Ranmuthugala G, Westbrook JI, Braithwaite J. Net benefits: assessing the effectiveness of clinical networks in Australia through qualitative methods. Implement Sci. 2012 Nov 2;7:108. doi: 10.1186/1748-5908-7-108. Ranmuthugala G, Plumb JJ, Cunningham F, et al. How and why are communities of practice established in the healthcare sector? A systematic review of the literature. BMC Health Services Research 2011 Oct 14;11:273. Ranmuthugala G, Brown L, Lidbury BA. Respiratory syncytial virus - the unrecognised cause of health and economic burden among young children in Australia. Communicable Diseases Intelligence. 2011;35(2):177–184. Nepal B, Brown L, Ranmuthugala G, Percival R. A comparison of the lifetime economic prospect of women informal carers and non-carers, Australia, 2007. Australian Journal of Social Issues.2011;46(1):91-108. Ranmuthugala G, Cunningham FC, Plumb JJ, Long J, Georgiou A, Westbrook JI, Braithwaite J. A realist evaluation of the role of communities of practice in changing healthcare practice (Study protocol) Implementation Science 2011, 6:49. Ranmuthugala G, Brown L, Thurecht L, Lymer S. Validating self-reported private health insurance status in the National Health Survey 2004-05. Australian New Zealand Journal of Public Health. 2010;34(6):572-577. Nepal B, Brown L, Ranmuthugala G. Modelling the impact of modifying lifestyle risk factors on dementia prevalence in Australian population aged 45 years and over, 2006 2051" Australasian Journal on Ageing, 2010; Vol 29(3):111–116. Ranmuthugala G, Nepal B, Brown L. Impact of home-based long-term care on informal carers. Australian Family Physician.2009;38(8):618-620. Nepal B, Brown L, Ranmuthugala G. Years of life lived with and without dementia in Australia, 2004-2006: a population health measure. Aust N Z J Public Health. 2008 Dec;32(6):565-8. Spencer R, Cardin A, Ranmuthugala G, Somers G, Solarsh B. Influences on medical students' decisions to study at a Rural Clinical School. Australian Journal of Rural Health.2008;16(5), 262-268. Nepal B, Ranmuthugala G, Brown L, Budge M. Modelling costs of dementia in Australia: evidence, gaps, and needs. Australian Health Review. 2008; 32 (3): 479-487. Ranmuthugala G, Brown L, Lymer S, Thurecht S. Hospital admissions in the NHS and hospital separations in the NHMD: What is the difference? Australian New Zealand Journal of Public Health. 2008;32:276 - 281. Ranmuthugala G. Ensuring the delivery of quality health care (letter to the editor). Australian Health Review. 2008 Feb 1;32(1):5-6. Wright AA, Ranmuthugala G, Jones J, Disler P, Maydom B, Charnley C, Kronus R, et al. Rural Organisation of Acute Stroke Team (ROAST) project. Internal Medicine Journal. 2008 Jan;38(1):32-7. Ranmuthugala G, Humphreys J, Solarsh B, Walters L, Wakerman J, Dunbar JA, Solarsh G. Identifying the aspects of rural exposure that influence medical students to take up rural practice. Medical Education (Letter to the editor). 2007 Jul;41(7):718. Milton AH, Smith W, Dear K, Sim M, Ranmuthugala G, Lokuge K, et al. Randomised intervention trial to assess two arsenic mitigation options in Bangladesh. J. Environ. Sci. Health, Part A. 2007;A42(12): 1897 – 1908. Caldwell BK, Smith WT, Lokuge K, Ranmuthugala G, et al. Access to drinking water and arsenicosis in Bangladesh. J Health Population and Nutrition. 2006;24(3)336-345. Falconer I, Chapman H, Moore M, Ranmuthugala G. Endocrine-Disrupting Compounds: A review of their challenge to sustainable and safe water supply and water re-use. Environ Toxicol. 2006;21:181-191. Dear K, Ranmuthugala G, Kjellstrom T, Skinner C, and Hanigan I (2006) Effects of temperature and ozone on daily mortality experienced in France during the August 2003 heat wave. Archives of Environmental Health.2005;60(4)205-212. Ranmuthugala G, Milton AH, Smith WT, Ng J, Sim M, Dear K, Caldwell B. Intervention trial to assess arsenic exposure from food crops in Bangladesh. Archives of Environmental Health. 2004;59(4);209-212. Pilotto L, Hobson P, Burch M, Ranmuthugala G, Attewell R, Weightman W. Acute skin irritant effects of cyanobacteria (blue-green algae) in healthy volunteers. Aust N Z J Public Health 2004; 28: 220-4. Murshed R, Douglas R, Ranmuthugala G, Caldwell B.. Clinicians' roles in management of arsenicosis in Bangladesh: Interview study. BMJ. 2004; 328(7438):493. Ranmuthugala G, Pilotto L, Smith W, Vimalasiri T, Dear K, Douglas R. Chlorinated drinking water and micronuclei in urinary bladder epithelial cells. Epidemiology. 2003;14: 617-622. Ranmuthugala G, Karr M, Mira M, Causer J, Alperstein G, Jones M. Opportunistic sampling from early childhood centre: A substitute for random sampling to determine lead and iron status of pre-school children? ANZJPH 1998;22(4):512-514. Hellard M.E, Sinclair M.I, Ranmuthugala G. Pilotto L.S, Padiglione A, Robertson B.E, Fairley C.K. Beyond Coliforms: Measuring Human Health Water (Journal Australian Water and Wastewater Association) 1997; 24(5):26 - 28. Ranmuthugala G, McInness E, Mira M, Atkin N, Rendalls S, Kennedy P. A comparison of stated versus actual GP participation rates in the general practitioner pre-discharge project. Australian Family Physician. 1997; Vol 26(s2):104 - 108. Mira M, Alperstein G, Karr M, Ranmuthugala G, Causer J, Niec A, Lilburne A. Haem iron intake in 12-36 month old children depleted in iron: case-control study. BMJ 1996;312:881-3. *Kjellstrom T, Lodh M, McMichael AJ, Ranmuthugala G, et al. Air and Water Pollution: Burden and Strategies for Control. In: Jamison DT, Alleyne G, Breman J. et al (eds.) Disease Control Priorities for Developing Countries (2nd edition) Oxford University Press, 2006. *McMichael AJ and Ranmuthugala G. Global Climate Change and Human Health. In: Kawachi I and Wamala S (eds.) Globalization and Health Oxford University Press, 2006.